Would you rather a buy the same timeshare for $20,000 or $2,000 — or maybe even $200? Some people are getting timeshares for cheap by buying them on the secondary market — from owners instead of directly from the developers. Savings of 50, 75, or even 99% are not uncommon say those involved in the resale market. Yet most timeshare owners or potential buyers don't have any idea they can buy a timeshare, also called "vacation ownership," used from an individual owner or through a resale broker. "It really is quite an enigma that this information for whatever reason is lost on potential timeshare buyers as learning about the resale market can save you tens of thousands of dollars for the exact same timeshare," states Brian Rogers on his website, the Timeshare Users Group, for timeshare owners, buyers, and renters. People might think there's a difference between new and used timeshares. There's not, Rogers says. Unless you're the first person walking into the room, there's no such thing as new timeshare. Its price may change, but the timeshare itself doesn't change over time. Through the last recession and anemic recovery, people who had bought timeshares during boom times became desperate to unload them. They lost their jobs, had incomes cut back, or perhaps found that the timeshare just wasn't worth the annual maintenance fees. 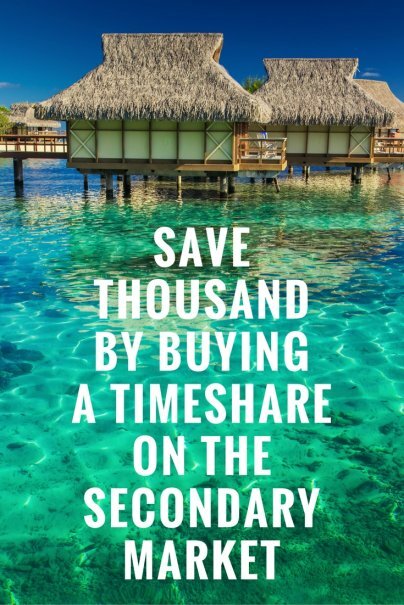 It's likely that more people would be buying timeshares on the secondary market if they only know they could. Developers have large advertising budgets, but timeshare owners must rely on their own ads or websites. The first step is to decide what you want. A particular resort or a site to use for trading for different locations? A fixed week a floating week for flexibility? Make sure you understand the rules for trading. A $1,000 week sounds great, but an off season week in Alabama may not be a good deal for you. Then, to search for timeshares on the secondary market, visit websites such as The Timeshare Users Group or TimeSharing Today. Those sites, as well as TimeShare Insights and the National Timeshare Owners Association offer plenty of resources. As usual, beware of deals priced especially low. Listings on eBay might start at $1. That should make you ask the seller some questions. Like why are you selling? Is it because of a bad location? Does the unit have a pile of unpaid fees? Be careful to perform due diligence. Verify that the timeshare's maintenance fees are current and the title is clear. Ask about the resort's amenities, amenities that are free or cost extra, utilities, cleaning, taxes, or other charges. Many experts recommend working through a broker; others say savvy buyers can handle closings themselves and pay for a title search and title insurance. Buyers, they say, can ask the resort if payments are current and can request the owner for a notarized letter affirming that the title is clear. If you opt for a broker, work through a licensed real estate broker who is a member of the American Resort and Development Association and who has a good BBB record. Some buyers mistakenly become overly focused on a particular resort when they could be missing a deal by buying a timeshare week for trading, advises Larry Hayden, a timeshare broker, in an article for TUG. Instead of concentrating on a certain resort, seek a timeshare for a low price in a popular area in prime season. That will give you the the power to trade that week for any week at any resort in the network. Buy a prime season week so you'll be able to exchange the week for any week in the year. Buy in a high-demand area like Hawaii, coastal California, or the Orlando, FL area. Seek a low price. Although that seems obvious, some buyers get sidetracked by other less important features. Buy in a resort with a reasonable maintenance fee. If possible, buy in a resort that's part of a large management system allowing you to get low bonus-time rates at resorts in the system. Buy through a licensed real estate broker with a trust account to hold funds until the sale closes. Be sure you get title insurance. If you're supposed to get the current year's week or banked weeks, get that in written in your escrow papers to make sure the seller has the same understanding. Don't get distracted by minor factors. Price, location and season are by far the most important for trading. The exchange company's rating — Gold Crown or Five Star — is less important. An in-season week in a high-demand area can be easily exchanged (or even traded) into a five-star resort. Despite potential bargains that abound, you may prefer to rent a timeshare to avoid an ownership commitment. Rental deals are available, as many owners are eager for income to cover their maintenance costs. They're advertising their vacation rentals on many of the same websites posting timeshare sales. I have had good vacations RENTING someone else's timeshare. Many of the resale outfits also act as rental agancies. Make sure you state up front and very specifically that you are only interested in renting, not buying.